Due to the large number of signatures on the petition a debate was generated at the start of the Council meeting. The Labour administration moved a weasel worded motion referring the concerns of the petitioners to the Council’s new Adult Social Care, Childrens’ Services and Education Committee which meets on Monday 1st July. Thames Ward Councillors Ed Hopper and David Stevens then moved and seconded an amendment which called on the administration to “cease all attempts to close Arthur Clark care home”. This was supported by all Councillors except for the Labour administration. Even the single Caversham Labour Councillor and Labour’s Reading East Parliamentary candidate voted against the amendment! After lengthy debate, Labour voted down the Conservative amendment and used their majority to push through their motion. Cllr Ed Hopper said, “I wanted to give the Council as a whole an opportunity to say that the Arthur Clark home should remain open rather than see the decision pushed off to a committee of which only a few Councillors are members. I was pleased that so many Councillors supported my amendment but disappointed that Labour used their majority to override the views of others Councillors and the large number of residents in the gallery”. At the end of the evening after the presentation of the petition, exhaustive debate, and numerous questions Cllr Ralph (Independent) moved a motion which many had expected him to withdraw. It was rather after the fact, as the Labour administration had made their position clear in the earlier debate, but in the spirit of cooperation Conservative Councillors had decided to support Cllr Ralph’s motion and voted against Labour’s inevitable amendment. In the most bizarre moment of the night Cllr Ralph then voted in favour of Labour’s amendment and against his own motion! You can watch the council meeting online on YouTube and see for yourself 'democracy' in action. 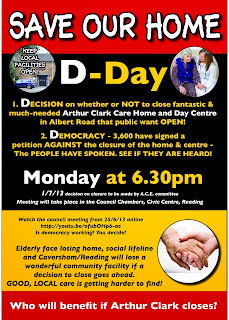 D-Day for the Arthur Clark care home is Monday, 1st July at 6.30 pm. Members of the public are encouraged to attend and, if they give advance notification of their intention to film proceedings are permitted to do so. Update You can read GetReading's report in today's paper here. 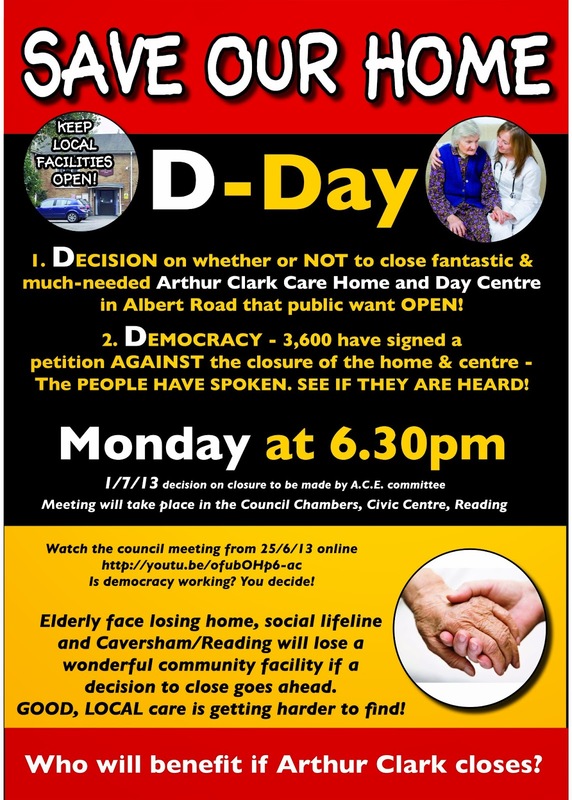 If you have a view on the future of the Arthur Clark residential care home why don't you post a comment?